Plantar fasciitis is the condition in which the plantar fascia (the band of tissue that runs along the bottom of your foot from your heel to your toes) becomes inflamed. Heel pain is a common result of plantar fasciitis, as irritation turns into inflammation or swelling. There could be a number of reasons for plantar fasciitis, so it is important to have the condition diagnosed properly by a podiatrist, who will be able to determine the underlying condition that is causing the pain in your heel. This is done with various imaging tests and physical examinations, and by asking questions about the patient’s symptoms and medical history. Pain and other symptoms can vary, and may be persistent or intermittent. Women over the age of 40 are at a higher risk, but this condition can happen to anyone, at any age, no matter their fitness level. Pain worsens as you stand, climb, tiptoe, etc. Sometimes sufferers will feel pain when they walk, run, or jog. Other times, the pain will not be noticeable until they slow down and relax, possibly even after waking up from a good night’s sleep. If you are experiencing any of these symptoms, you should consider seeing a podiatrist before the problem worsens. The main cause of plantar fasciitis is a biomechanical imbalance that causes inflammation of the soft tissues of the lower leg and the bottom of the foot. This inflammation can be brought on in a number of different ways. Often, plantar fasciitis can be alleviated wearing a quality arched sandal (Birkenstock, Dansko, and Keen are all good brands). If you wear shoes that do not fit you properly, whether they are too tight or too loose, they can cause plantar fasciitis. If your shoes do not offer any arch support, are not made of shock-absorbent materials, or have thin soles, plantar fasciitis may result from wearing them. The problem could also lie in how you walk. Flat feet and over-pronation are the leading causes of plantar fasciitis. If your arch collapses when weight is applied by walking, the plantar fascia is stretched. Obesity or weight gain brought on by pregnancy can also stretch the plantar fascia. When a woman is pregnant, she has to learn to walk differently while carrying the extra weight. This can put stress on the feet and sometimes results in plantar fasciitis. Also, the water content in our tissues decreases as we age, and they become less pliant. During the night the foot relaxes and the plantar fascia shortens, so stepping down onto the floor for the first time in the morning can be painful. Stretching first thing in the morning by rolling the foot over a tennis ball can be quite helpful. If you are concerned that you may be suffering from plantar fasciitis, you should seek help from a foot doctor. He or she will run a series of tests, checking for tenderness and signs of other conditions such as tendonitis, cysts, foot arthritis, or nerve irritations. Your doctor may also take x-rays to rule out stress fractures, and may order a diagnostic ultrasound to measure the thickness or inflammation of the plantar fascial band. You may also be asked about your normal activities, medical history, and diet. Usually your podiatrist or doctor will first try non-surgical treatment methods that begin at home with you. 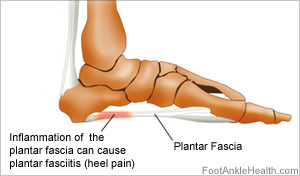 Again, plantar fasciitis is usually brought on by a biomechanical imbalance of the foot, which causes inflammation of the soft tissues of the feet. If you are inactive most of the time, but suddenly find yourself on your feet for days at a time, you may see an increase in heel pain. In most cases, plantar fasciitis can be treated at home. Only in rare situations is surgery necessary. If the problem does not go away after you have attempted to treat the condition at home for a few weeks, your doctor may add one of the treatment methods from the second list to your treatment plan. This condition is curable for most people, but your plantar fasciitis may end up being a long-term condition. The underlying cause of the condition may never go away, so sudden flare-ups are always a possibility. Recovery times vary from weeks to months, depending on the cause and the severity of the condition. Preventive measures may need to become a way of life for you if you wish to avoid the effects of plantar fasciitis in the future. Surgery or shock wave therapy may be necessary if the condition does not disappear after six months of treatment. 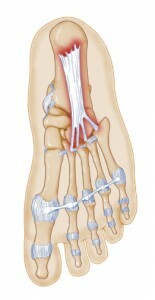 Surgery for plantar fasciitis is rare. There are two types of plantar fasciitis surgeries, both of which involve cutting and releasing the plantar fascia. Traditional plantar fascia release is one common technique, but it is being replaced by a newer procedure—endoscopic plantar fascia release. The difference between the two is that endoscopic plantar fascia release uses a tiny camera to view the plantar fascia in order to make the cut. Thankfully these procedures are rarely used, and in cases that require surgery, 70–80 percent of patients find relief. Those patients who still have symptoms after conservative treatment has been tried, and who understand the risks involved with surgery may consider either procedure. What Are The Risks and Complications of Plantar Fasciitis? There are several risks and complications associated with this condition. If you are over 40 and female you are twice as likely to develop plantar fasciitis as a male of the same age. Based on my activities, how often can I expect this condition to recur? What symptoms should I watch for that may indicate the condition is returning? If symptoms reappear, how long should I wait to see you again? Should I wrap or ACE bandage my affected foot at night? What should my diet consist of? Are custom orthoics right for me?